We started this project in 1999. Meet the team here. Late that year, we created the the world first and longest running wireless mobile weathercam & weather station. In 2002 we filed the first ever hurricane report to the National Hurricane Center over IRLP (Internet Radio Linking Project) during Hurricane Lili from Morgan City, Louisiana. In 2003 we reported from Atlantic Beach, NC during Hurricane Isabel. In 2004 we reported from Alex in Cape Hatteras NC, Charley near Punta Gorda FL, Frances in Port St. Lucie FL and Ivan in Gulf Shores AL. And in 2005 during Hurricane Dennis in Gulf Shores, Alabama, we submitted the world's first MOBILE voice over IP report to the NHC using Echolink and Verizon Wireless and Sprint wireless solutions from SET1. Our Echolink reporting continued that year for Ophelia in Atlantic Beach, NC and Wilma in Naples FL. StormStudy is a personally funded project with the goal of providing constant public awareness of severe weather threats to the citizens of the United States including Flooding, Thunderstorms, Tornadoes, Lightning, Hurricanes and dangerous winter weather. 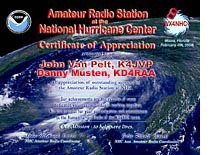 We also help gather weather data, that's helpful in forecasting and verifying severe weather, for the National Weather Service Forecast Office in Raleigh, NC and other areas in which we travel through our affiliation with Central Carolina Skywarn, the volunteer spotter organization in our part of North Carolina. 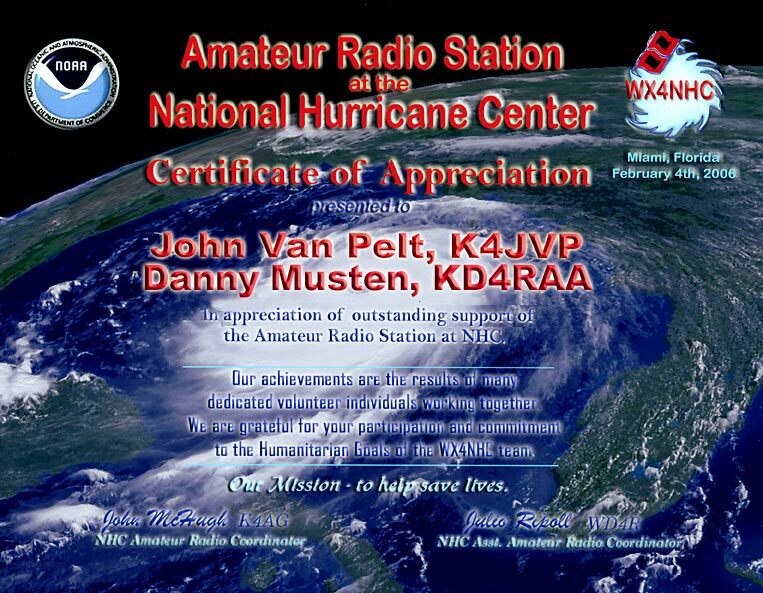 During Atlantic Hurricane Season, we travel to the sites of hurricane landfalls to help with ground truth reporting for the National Hurricane Center via Amateur (ham) radio. This website serves as a link site to other weather resources on the web, video and reports on severe weather wherever we are. Wherever we go, the StormStudy truck will always post any severe weather watches and warnings as they are issued by the National Weather Service. If you see a watch on the SET1, tune to NOAA weather radio or local radio for more information. If it's a warning, it means severe weather is imminent in the area and you need to be prepared to take appropriate actions to save your life and property. Be sure to check the sponsor page to see who's helping us get the job done. Thanks for visiting! On the Storm Education Team Suburban's rear roof, you'll see the lightbar with the integrated messenger, and now there's an even larger moving message board on the driver's side of the roof rack. These messengers are normally used to display a scrolling message with educational and safety related weather messages. During watches and warnings the message boards display the latest on the severe weather threats. Also during hurricane season, Tropical Weather Advisories are posted on the boards. Software allows instant updates of the message to suit any situation. Clicking one of these images will open the fullsize photo. We have completed the installation of our Clark Masts YT15S pneumatic mast from Antenna Research.. We have the first photo of the mast deployed at 10 meters high, posted here. You can see more exterior photos BEFORE our latest upgrades on SET 1 here. Our most aggressive upgrades that lifted the vehicle , are shown here. We added the Superlift 6" F.I.T. lift including steering stabilization, super premium shocks, new skid plate and differential protector. Global Off-Road & Diesel regeared it with gears from Randy's Ring & Pinion to give us our power back! Here's where the rubber hits the road too - the Interco TrXus STS tires on the Weld Racing Sandstorm wheels are fantastic! The exterior also shows the super heavy-duty Road Armor bumpers, the impressive front and rear protection for the truck AND the mounting platforms for the Mile Marker winches (hydraulic in front and electric in the rear) and the PIAA High Performance lighting systems. We have PIAA 4040 floods on the rear, plus 510, 580 & 1400 driving, fog & floods so any situation can be WELL illluminated. The new Davis Wireless Vantage Pro2 Integrated Sensor Suite and anemometer are on the passenger's side and with the new spread spectrum, frequency hopping technology, the range from the sensor suite to the spare console is incredible! An RM Young WindMonitor anemometer is also mounted on the roof rack and includes a compass that corrects for vehicle direction. The Nera World Communicator Voyager is a vehicular Global Area Network (GAN) satellite terminal for video streaming, voice communications and internet access from anywhere in the world. The unit on the roof employs a tracking antenna that stays locked on the satellite when the vehicle is in motion. The newest addition to the roof is the high resolution Pelco Esprit camera system that will tilt and pan in 90mph winds. It also has a 'windshield' wiper AND is pressurized to prevent fogging. PIAA SuperSilicone Wipers are also on the front and actually help shed water, besides being the best wipers we've ever used! There's also a remote controlled spotlight that can turn 360 degrees, plus it tilts up and down to illuminate obstacles that could pose a danger to the truck in bad weather and other low visibility situations. The interior shot shows the new 17 inch touchscreen monitor for the computer, the controls for the message boards and lightbar, the auxilliary light and equipment switches, the NOAA weather radio, PA system, the Kenwood 2 meter/440 ham radio control on the front of the Davis Wireless Vantage Pro 2 console, the XM Radio, 900 mhz and GMRS radios, video switcher and LCD TV. An RM Young WindTracker display is mounted above the Vantage Pro2 console. The computer plays a very important role in running the truck. It runs the Mobile Threat Net system that tracks storm AND vehicle motion using the XM/WX satellite feed - for coverage EVERYWHERE in the U.S. You can see Hurricane Charley moving towards landfall in Punta Gorda Florida on the laptop's Mobile Threat Net display. The white dot in the middle of the circles on the display showed where the vehicle was (at that time in Bradenton Beach, FL) less than four hours before landfall. Also, with the wireless internet card, it is connected to the net to download satellite imagery, forecast and warning data. StormStudy site visitors can also see the live weather data and TruckCam, too - the photo is new every minute and weather conditions update every five minutes wherever we go. Over the years, we've used CDPD, 1XRTT and EVDO data solutions from Verizon Wireless and Sprint. Another laptop function is GPS navigation and of course to send and recieve email on the road. It's connected to an HP Deskjet 450cbi printer that prints everything we need, like watches, warnings, advisories and storm graphics via USB, infrared or Bluetooth! We also have a Globalstar satellite phone and Extreme docking kit from Mackay Satelllite, so IF every other mode of communication (and the power) fails, we can talk from inside our vehicles, staging areas or outside, during and after the storms. There's also a 500 watt inverter under the back seat for running devices that require house current. All of the non-Chevy gear runs off a 255 amphour Lifeline Battery. We shoot all of our still photos with a Nikon D70 digital SLR camera. On the left side of the console, there is also a video switcher and microphone mixer to allow TV media to take audio and video feeds from the truck. All the non-Chevy gear runs off a 255 amp hour Lifeline battery on the Bedslide behind the back seat. The Mobile Weather Center features a full compliment of equipment to monitor the weather. Wireless internet and Mobile ThreatNet system lets us keep up with the latest satellite and radar imagery, while the Davis Weather Vantage Pro 2 constantly monitors site weather conditions wherever the we take the trailer. Clicking this image will open the fullsize photo. The exterior shows the PIAA High Performance lighting on the front of the rack. The Davis Wireless Vantage Pro Integrated Sensor Suite are on the rear and the anemometer is mounted on a telescoping mast. A remote controlled GoLight is mounted on the rear of the truck and is a valuable tool for spotting downed lines and low-hanging pbstructions at night. This truck has Interco TrXus Mud Terrain tires for serious 'digging out' after the storms pass. Being the primary communications vehicle, it has a large array of antennas on the roof. From front to rear we have 900mhz, GMRS (will allow communications with CERT, Citizens Emergency Response Teams), Ham 2 meter and 440, Wi-Fi (2), high-gain cellular, XM and GPS antennas. You can see the large Tarheel Antenna 'Bubba', the HF (worldwide capability) amateur antenna on the right rear. This antenna raises and lowers the coil section in the middle to tune itself to the proper bands used on the HF rig. This vehicle also carries the remotely deployable GMRS and Amateur radio repeaters that let us set up wider range emergency communications. These repeaters work sort of like cell sites, allowing storm spotters (ham radio) to report to the networks supplying information to the National Hurricane Center and National Weather Service and CERT groups (business band) to help with disaster recovery communications in affected areas. We'll have the INTERIOR photos of the truck here soon. Clicking these images will open the fullsize photo.You can see more interior photos here. The shot above features our Hardigg Double Duty Field Desk (they make our Storm Cases too) with room for all our mobile office supplies and gear. It packs into a cube, easily transportable with it's built in wheels. Each desk has its own chair and six outlet powerstrip built in and a six drawer center section. On the desk you'll see one of our HP laptops running Mobile Threat Net, the Motion Computing Tablet PC running Field2Base software, the Davis Wireless Vantage Pro 2 console, the HP DeskJet 450 printer, the NOAA weather alert radio and the Pelco remote camera keyboard. When the power's off and preparing meals is a problem, we're ready to eat with our MRE's from Crown Point. They make some of the world's best selling, complete meals ready to eat. You can see their full line here. The heart of the project from 1999-2004 was a 1997 Dodge Ram 1500 packed with gear!